When I learned about the Bullet Journal system, I was quickly drawn to the option of housing this system inside a traveler’s notebook. The original bullet journal system is primarily in one notebook — but I quickly realized how much I wanted some semblance of categorization or separation in one place. This led me to the rabbit hole of traveler’s notebooks. Despite a few downfalls, I love this system because I can separate different parts of my life, replace one portion at a time, add whatever parts I want, and further customize what works for me. 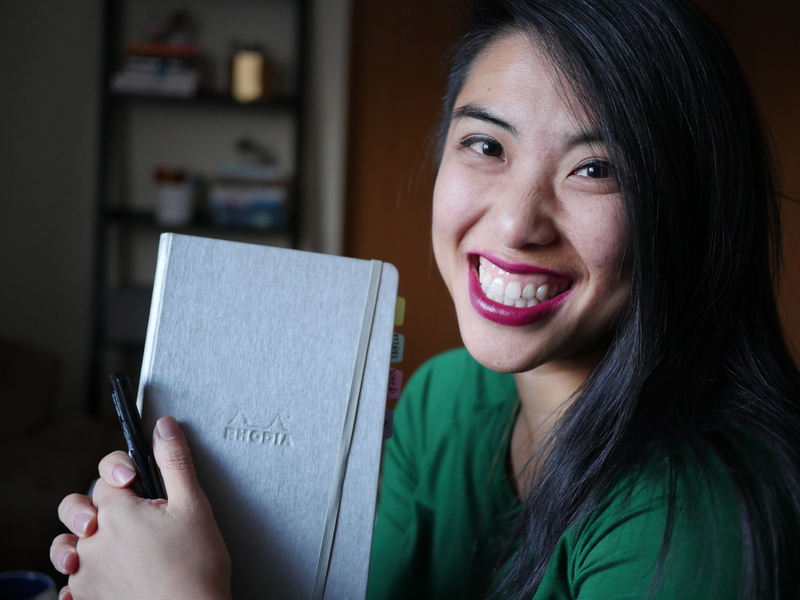 To feed the beast is the new Facebook group, Bullet Journal in a Traveler’s Notebook. Are you thinking of trying a traveler’s notebook system? What are you including? Let me know down below! That’s great!! Did you decide on any yet? This is AWESOME! Thanks for sharing. Loads of great info and ideas. I love your system!! You inspired me to switch from notebook to inserts! I need to keep my teaching stuff separate from personal. I loved your last post on educator tips. I immediately took one of my 15 extra inserts (went a bit crazy on etsy inserts) and made one so I keep 5 inserts: daily, educator, collections, art journal and a weekly insert for future planning. I love my system… Bought a FoxyFix which is gorgeous! I buy my a5 inserts from Travelers Time on etsy… Wicked cheap, 90 gram silky paper! Thank you for introducing me to a great system that has changed my life and job!!! That’s so great to hear from another teacher!! 🙂 I haven’t tried traveler’s times, I should check them out! Do they sell dot grids? Thanks for posting this! I’ve been bullet journaling since last December in a moleskin and I keep seeing references to “TN” and “inserts” on Instagram… Finally understand what they’re talking about! Definitely will check this out for when I fill up my moleskin! I have been using a bullet journal for collections for a while and now I am moving to doing a full system in a travelers. I only index my collections;). is your TN the Foxy Grand No. 8 that fits the MayDesigns?? this is the No 7! After buying my first May Designs book, I have been hooked on starting a TN system after finishing my Leuchtturm1917. I think I will have one for my collections, planning, and one for creative ideas. Thanks for posting about this! What did you settle on for your new TN? These inserts are great! I currently use a L1917 and I am really thinking about moving into a travelers notebook. I’m just confused about sizes; do different artist very the sizes or are they pretty standard? What size do you recommend? I love the size of my L1917 and would want to stick with that. I love Foxy Fix because they have SO many different sizes – their A5 size is close to a No 8 which would be lovely 🙂 sorry for the delay in my reply! I’ve been researching bullet journaling since I was pregnant with my daughter. She is 8 months old now and I am finally going to start a system! I didn’t like the prospect of migrating collections or long term tracking, so I was trying to think of a way to use a travelers notebook to make my life easier. Your system is just the inspiration I needed! Thank you for sharing. I plan to have dot grids for my bullet journal (dailies, short term tasks and trackers) and for my collections insert which will also include future planning and long term trackers. I want a third notebook with blank thick pages that I can use for journaling, prayer journaling and multimedia art. I am so excited to start! Planning to start this journal has helped me to see my life more clearly and is bringing me Joy! What paper weight do you recommend for the bullet journal for no bleed through and for the multimedia art journal? So happy I found your post. Been struggling with my Bujo and my TN and was searching for info about bujo in a tn and then I found this post. Awesome!! And also very happy to find the facebookpage you mentioned. Thank you so much! As an upcoming newbie to journaling this information will be helpful for now and referencing. Just love WP and this reblogging feature. Can’t wait to get my Chic Sparrow A5 Travel Notebook. Stay tuned! Yes, I do plan on using a bullet system. My CS A6 was ordered last week and meanwhile I am reading all I can get my eyes on about journaling. As a matter of fact I am seriously considering making wallet inserts for TN’s and selling them now. Thanks in advance for your response in this article. I’m off now to read and view it. Almost to tests yesterday wondering if I would be able to bujo in my TN. I don’t want to abandon my beautiful Midori style cover. I love the size and idea of separate but together notebooks. Stressing about whether I would run out of room in my inserts before I was ready. I made my own guessing as best I could on page numbers. I used 20 full pages to give 40/80 pages for a 6 mo planner. I have a separate one for collections and another for journaling. I guess I just need to dive in and see how it goes for a while.